The build quality and mechanics of the Grip-On’s far exceeded the other models we looked at. 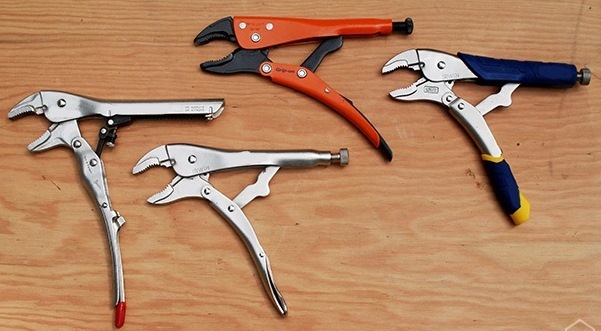 None of our testers knew that a pair of locking pliers could be so smooth. 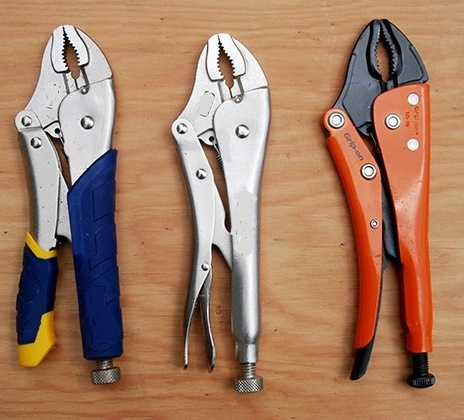 As part of the research for this guide, I also spoke with Stuart Deutsch of Toolguyd.com and Harry Sawyers, editor of The Sweethome and former editor at This Old House and Popular Mechanics. During testing, we found that the best of the styles is the upward release lever (found on both our main recommendation and our runner-up). For more detailed information on how the different styles work (and why we don’t recommend some of them), see the Competition section. 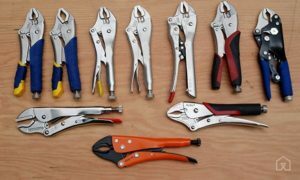 After spending time researching locking pliers, we chose our test candidates based on company reputation as well as customer feedback at retailers etc. As for the specifics of our testing, I enlisted the aid of two other carpenters: Aaron Goff, with 12 years of experience in high-end remodeling, and Mark Piersma, with 14 year’s experience. 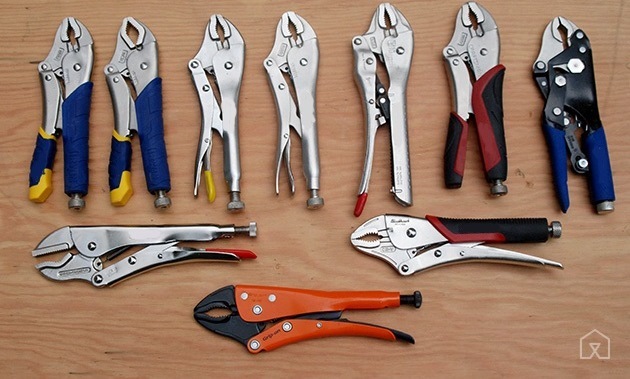 Each one of us handled all of the pliers with time spent clamping, locking, unlocking, and adjusting. Once there was a consensus as to which one was the best—and really, after examining the whole test group, the winner was clear—we did a second round of testing in which I exclusively used our pick for eight months as I wrapped up the full gut and remodel of my 100-year-old farmhouse. The jaws of the Grip-Ons are long and capable of maximum grab of about 2 inches. The teeth themselves are deep and aggressive. I tried them out on a variety of bolts and pipes, and once this tool is locked on, it’s not going anywhere. Because of an epoxy coating, the tool has an interesting orange color that is not only oddly stylish and attractive for a hand tool, but it makes them far less likely to lose. I’ve never had a problem spotting them in a toolbox or on my workbench. The upward release lever is the easiest to use and it offers the most control over the tool, so that detail really guided us as we narrowed in on our picks. In this style of lever, once the jaws are locked, just slide your hand back on the handle and simply pull the lever upwards. During the process you can maintain full control of the tool with the one hand. The release is smooth and not jarring. Our recommended Grip-Ons have this style as do our runner-up products from other manufacturers. In this category, we also tested other Made in EU pliers. These are very nice and have a release lever that is almost, but not quite, as nice as the Grip-Ons. These also have what others calls a “universal jaw,” which is supposed to make it easier to grab a variety of shapes (round, hex, and flat). We couldn’t find any real additional benefit to them compared with the Grip-On jaws. That, combined with the fact that they’re almost twice the price of our pick, led to their dismissal. 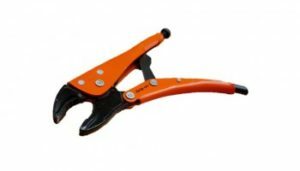 The second style of release, the downward lever, is the one most typically associated with locking pliers. It’s a similar but mirrored design compared with the upward lever—the unlocking lever is in roughly the same place, but it needs to be pressed toward the lower handle and not the upper one. This means that you either need to use two hands to operate it or drop one hand entirely down to the lower handle. This method is not smooth at all and in fact, the jaws tend to release with a violent pop that can cause the tool to jump right out of your hands. Another issue is getting your palm stuck between the lower handle and the release lever, which can easily lead to a blood blister. This system appears to be the least expensive to manufacture as we found quite a few models, like these Tektons and these Fullers. As for tools using the downward release lever, we tested others and the USA brands neither of which impressed us in any way. They’re functional, but beyond that, there’s not a whole lot to say about them. The unlocking mechanism also affects how far the handles need to open. Notice that the Grip-Ons (orange) open the least amount, making them the easiest for one-handed operation. 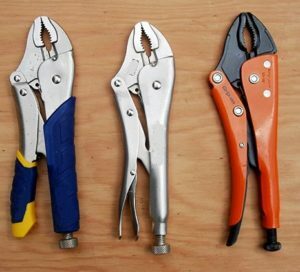 The far left pliers have a great self-adjusting feature, but the handles open so wide, they are nearly impossible to grip with one hand. Of the tools with no release lever, we tested the USA brands. They all have beefy padded handles, which is nice, but it was ultimately the awkwardness of the release that caused us to dismiss them. Locking pliers are a very useful tool to have around, and the ones to get are definitely theGrip-On 111-10. They’re more expensive than most, but no other pair beat them out in terms of ease-of-use, finesse, and overall build quality. We have a runner-up options, but strongly recommend going with the Grip-Ons for just a bit more. You won’t regret it.